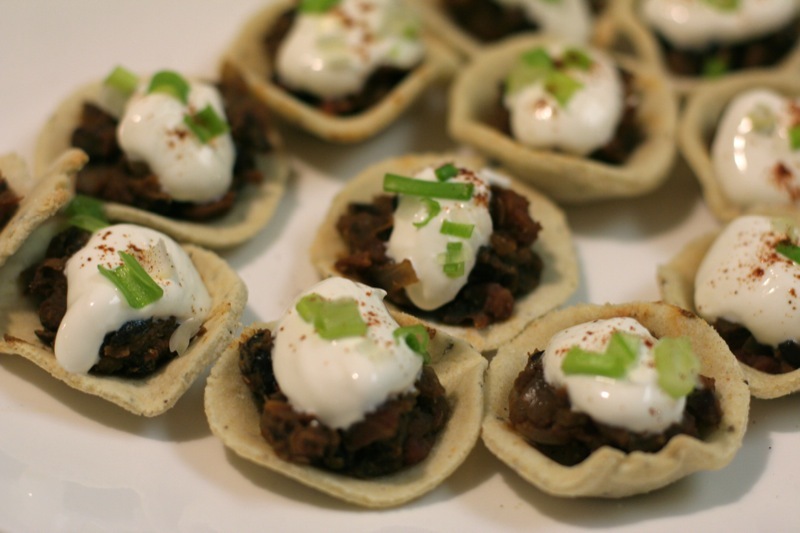 Taquito Cups, or perhaps mini corn-taco salads? I really could not figure out what to call these cute little appetizers, so suggestions are welcome. 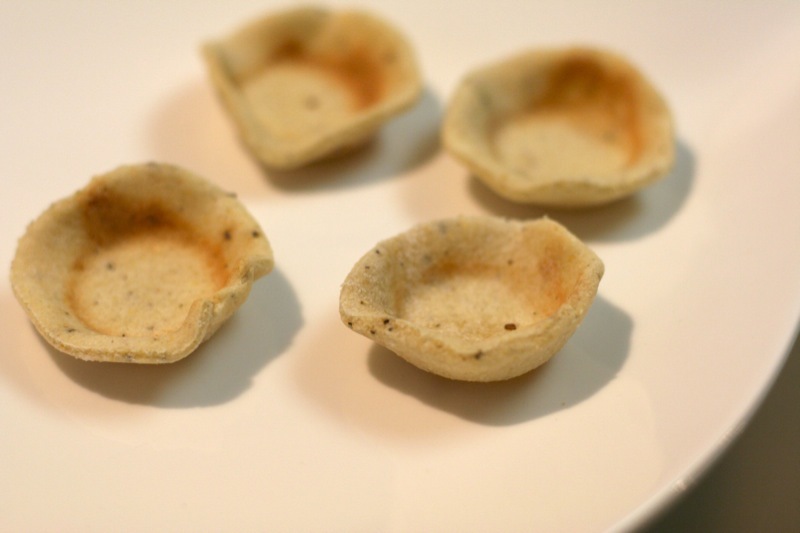 These are quite easy to whip up for a quick snack or as appetizers for a party. The concept is simple – cut rounds out of a basic cornmeal dough and bake them into cups, molded over the back of muffin tins. Fill with anything you want! I usually make a black bean filling, but have also filled the cups with guacamole. Alternatively – the cornmeal dough is great as a pizza crust (pre-bake it a little), and the black bean filling makes a phenomenal sauce. Try it! The cups are made out of a basic unleavened cornmeal dough. I have been searching high and low for the website where I had originally found the recipe and just cannot put my browser’s fingers on it. This is a pretty good approximation of it, but the yeast is not needed for this particular recipe. The all purpose flour is really essential to the dough for the elasticity factor. 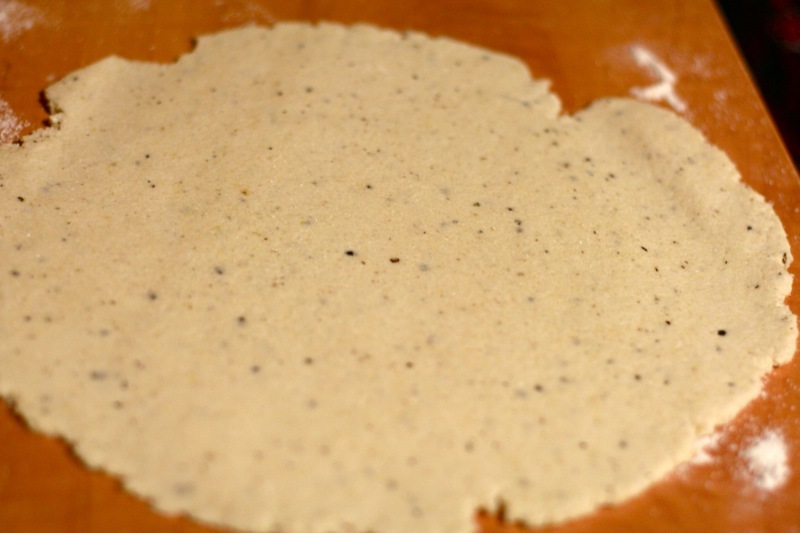 Cornmeal by itself is not smooth enough to roll out. If the dough is cracking on the edges when you’re trying to roll it out, add a little more white flour and a little more water until it is smooth. You should be able to roll out a big sheet of it when it is the right consistency – it is grainy but completely rollable. So, using this recipe, make cornmeal dough. I usually add cracked black pepper also, enough so you can see it running through the dough. 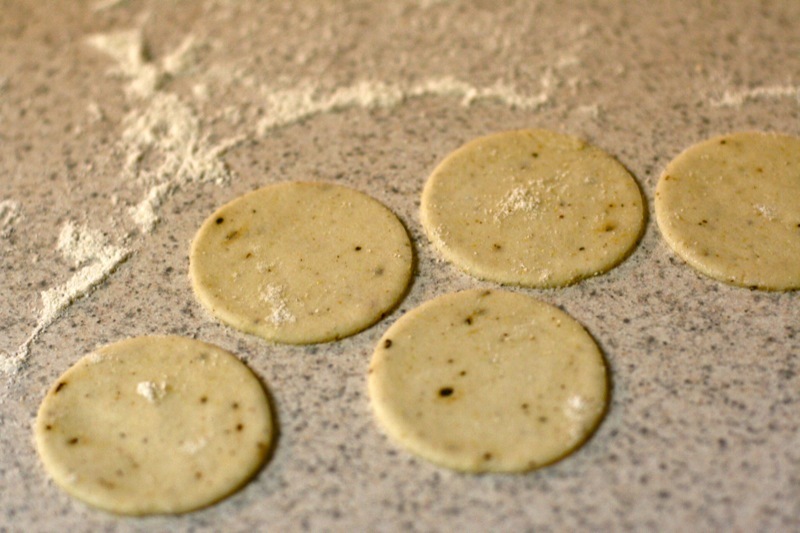 Once the dough is smooth and elastic, roll it out quite thin and cut rounds using a cookie cutter. If you are using mini muffin cups like I did, the circles should be about 2 – 3 inches in diameter. 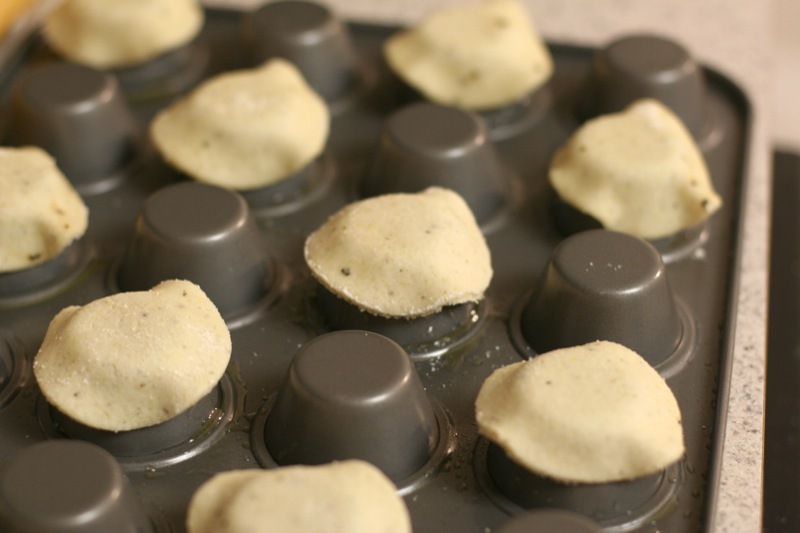 Brush some oil over the back of a nonstick mini muffin pan (i love this thing) and place the circles on the back of the cups. Press down slightly to make an upside down bowl shape. Put the cups into a 400F oven for 8-10 minutes. Keep an eye on them – the cook time depends on how thin your dough was. You’ll know they’re done when they pop right off and are strong enough to hold their shape. Pop the cups off the muffin tins and put them onto a plate or serving platter. — Sautee the onions and garlic until soft and fragrant. Rinse the black beans and add them to the onions and garlic. Add the tomatoes with their liquid, spices, and coriander chutney and cover the pan. 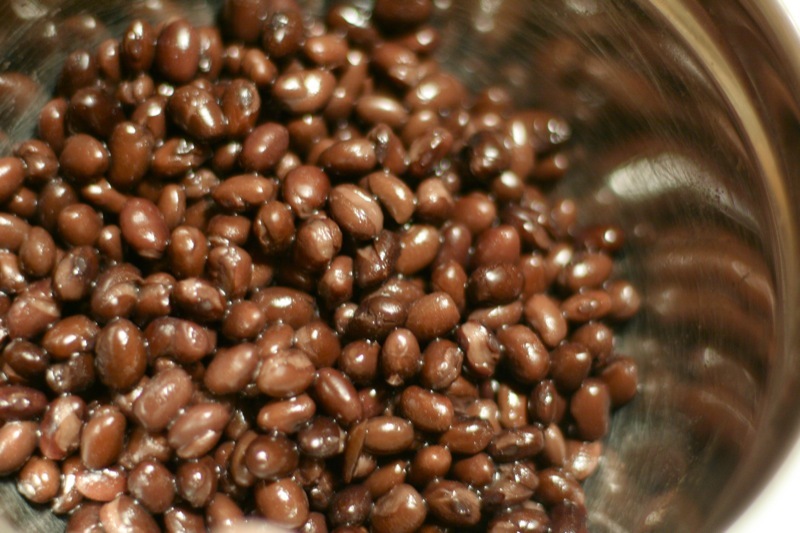 — Let the mixture simmer heavily until the beans are soft, about 10 – 15 minutes. — Using a potato masher, squish half of the beans and stir to incorporate into the rest. Mix in the coriander and stir. Remove from heat. P.S. This stuff is great as a pizza topping (and you’ve already got a cornmeal crust recipe above! I would add the yeast if you’re going to make it as a pizza dough). 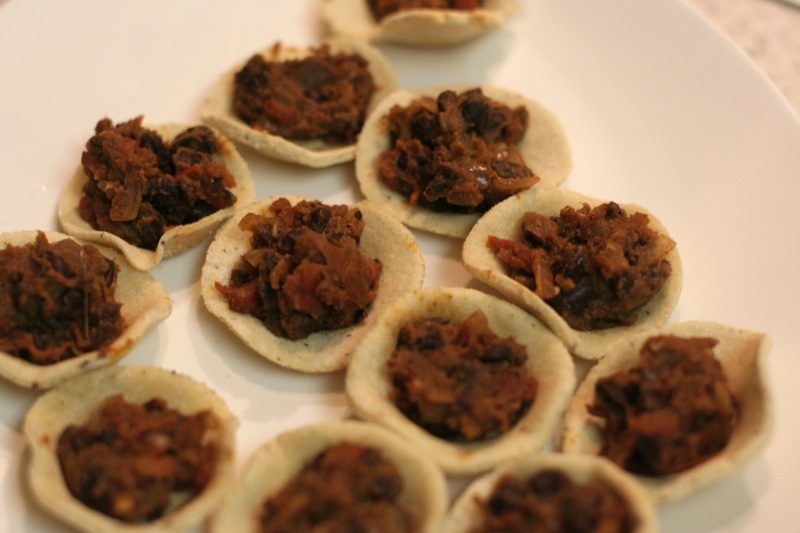 Fill each cup with a teaspoon of the black bean filling. Top with some sour cream, and sprinkle with cayenne/paprika and chopped scallions. Serve warm or room temperature.